As one of the most popular photo and video sharing apps, Instagram is great on iPhone. 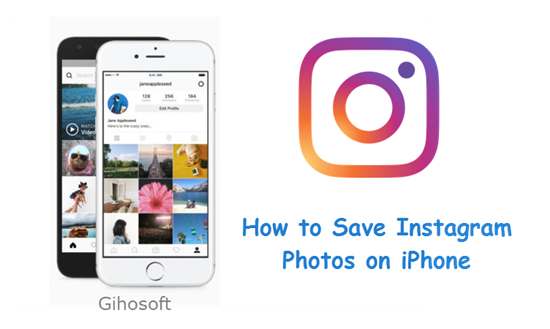 However, as you continue using it, sooner or later you will meet this problem: how to save those beautiful photos from Instagram on iPhone? Since Instagram doesn’t allow users to save others’ pictures, it might drive you to crazy if you see an amazing photo yet you can’t download it. Screenshot may be the easiest way, but it limits the quality of the image. Hence this post will show you two more ways to download high quality photos from Instagram on iPhone. Although a little inconvenient, the most common way to download an image from Instagram, besides using any third-party downloading app, is by using the iOS Notes app. You may be surprised by the useful feature of this little note-taking app. Just follow these steps to save Instagram photos with iPhone Notes! Click on the share button of the Instagram image you want to save on iPhone. 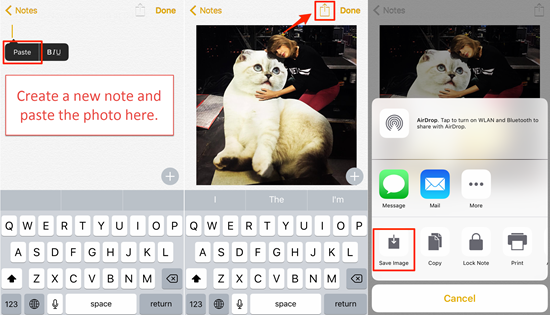 Create a new note on the Notes app, then long press to paste the photo and tap the share button on the top to choose “Save Image”. Afterwards you can view the image on your camera roll on iPhone. Note: This method only works on saving single photo. If you want to get multiple photos from Instagram, either repeat this method, or follow other ways below. Workflow is a powerful app on iOS App Store, once needed to get paid, now free for everyone. It’s famous as a personal automation tool, allowing you to combine a series of actions to simplify repetitive boring works with other apps, such as making GIFs and so on. Also, it can be used to download photos from Instagram on iPhone. Just follow the steps below to save Instagram images with Workflow. 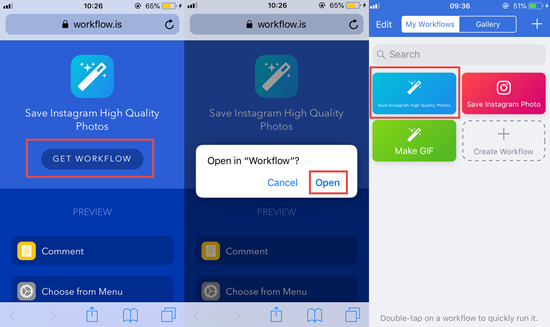 Install Workflow on your iPhone, and click this to install the Workflow order that can download Instagram pictures. Open Instagram and find the photo you want, and then click on the share button to “Copy Link”. Go back to Workflow and tap the order you just installed, and then click on the Play button to let it save the content from the URL. Choose “Save one photo” or “Save all photos from a specific user” according to your need, and then wait the process done. Afterwards you will see the photos in your Camera Roll. Note: There are many Workflow orders on the Internet to save Instagram photos and videos, but before you use any of them, preview first to check whether they can download multiple photos or just one at a time, and where do they save the photos. It may take some time for Workflow to download Instagram photos according to the original size of the image. Of course, apart from the two methods we mentioned above, there are also some great apps specific for downloading photos and videos from Instagram, such as Grab for IG. 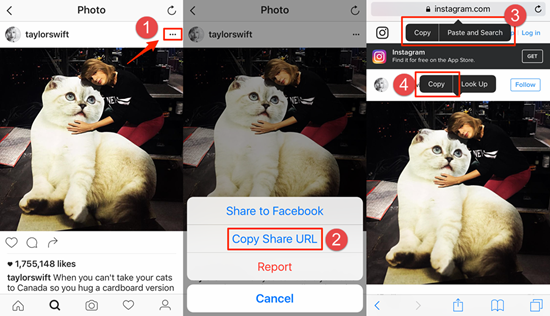 It’s easy to use: you just need to copy the link of the photo you want, and paste it on the app, then you will get the downloaded photo on your iPhone. If you accidentally deleted or lost saved instagram photos on iPhone, you can use the professional Gihosoft iPhone Data Recovery software to recover deleted pictures from iPhone, as well as other important data like messages and contacts.